After having to cancel a total of six airline tickets over the past 16 months, I'm thinking of applying for Frequent Canceler status. Although the airline won't refund my ticket purchases, it does give me a "credit" toward a future flight. Uncannily, however, the cancellation fee approximates the credit amount. This means that going through the exercise of canceling the reservation is effectively the same as simply not showing up for the flight I've already paid for. Perhaps restaurants struggling to survive in this economy should try a similar reservations policy. Patrons failing to appear will be billed for the meal they didn't eat, along with a surcharge for the tip on service they didn't receive. When you think about it, there aren't that many places you can go to experience an Eskimo blanket toss. And now Americans across the nation know where they can go to fill that experiential void, thanks to a breezy letter from the Governor of Alaska, who signs it just plain Sarah. Gov. Tim Pawlenty is off brushing up his 2012 credentials by flying to Israel on a trade mission, right about the time the Israelis are spanking Gaza. Meanwhile, while Palin finds a reason to send direct mail to the rest of the country — offering the official Alaska travel guide. It's cynical especially to see this as Palin campaign ploy. Afterall, her brand is more recognized than her state's, so it's possible the bureau of tourism came up with the idea of showing a picture of Palin instead of a mother moose and calf. I plan to pass on the FREE guide, but am still considering returning the survey card, which goes business reply mail back to Portland, Oregon. Have you decided to visit Alaska? I have, but "Yes, when hell freezes over" is not included as a response. About destinations visited in the last 10 years, mixing — as does the governor — continents, countries, regions, one state and the ever-popular "None." Except for Alaska, the check boxes neglect the entire Pacific and Indo-Asian part of the world, including the place where the governor's son is currently visiting, so two of my major travel destinations aren't represented. If you have children at home, but not whether you intend to fly all of them and their boyfriends with you when you travel. Personally, I can't think of better time than January for Americans — especially Minnesotans — to start thinking about Arctic travel. Biking through small Portuguese towns, it was hard to miss how modest touches created beauty and individuality out of the mundane. Who Gets Busted for Funny Stuff at the Airport? He [a US Customs press officer] speculated that the Finns could have been singled out because they were arriving from Amsterdam, considered high risk for narcotics trafficking. From the rest of the story, it sounded like there were suspicions the musicians, without a work permit, were in the state to earn big money playing Finnish folk songs. Maybe the casually dressed business guy was meeting friends for some sort of Rocky Mountain high fun and wanted to stick to golf on the weekend. Seemed like he was saying — not all the words were making it to me — Roger can toke up, just not in the hotel. But then he started talking about "using the plane" and the DEA. It became clear he was talking about transporting a quantity of weed aboard a non-commercial aircraft. The guy was sitting in first class when I boarded. I was tempted to lean over and whisper, good call on the marijuana thing. Most days when I head through North Minneapolis, I see the young guys "waiting for the bus." On the other side of the divide in their business, the prosperous gentlemen fly first class. Bikes Regaining Their Communal Nature. ""There are all these community bike programs around the country," [Brian Lacy, director of community cycling in Portland, OR] said, "and they all are dealing with abuse of the program, meaning vandalism or appropriating of property." — "Failed Yellow Bikes project will get another go-round"
"They (in Nicaragua) quickly discovered that when the people didn't pay for the bikes, they abandoned them," Calvert said. "It lowered the value, at least in their minds, of the bikes. I felt that was a very profound lesson about the way that people treat bikes and perceive value. "It's not any different in that people perceive the value of objects partially based on what they paid for them, whether it's in Nicaragua or the United States." As someone said of the stolen Portland bikes, which were refurbished junkers painted yellow, "they lost their communal nature." Portland has now tried again on a smaller scale by launching Green Bikes. Conservative critics (I seem to recall an SCSU Scholars post I couldn't immediately locate) have made the same point. Such programs can work in the social democracies of Europe and Madison, Wisconsin. But they've experienced failures in other U.S. locales. We may want people to behave in an unselfish, communal way, but it appears enough don't to ruin it for the rest of us. 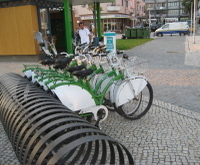 Aveiro started the BUGA project (Bicicleta de Utilização Gratuíta de Aveiro) in 2000 with the aim of reintroducing the bicycle into the town's day-to-day life. Anyone can check out a bike from a tended city kiosk where your ID is scanned to ensure its return. Then you're issued a bike, lock, and helmet if you choose. The bikes are heavy 3-speeds in different degrees of workable condition — nothing you could imagine anyone would steal. An undated use study of the Aveiro program showed slightly more than half the users were from out of town, or tourists like us. Primarily, the bikes provide an alternative to walking rather than driving, so their ecological impact is negligible. 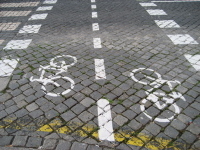 The city has made additional accommodations to bikes, such as marked paths and even bike signals for a path down the middle of the main thoroughfare. It's possible the PR value of the program is its greatest asset. After all, it got us to choose to spend the night there versus other more distinguished towns in the region. Another community bike model has taken hold in Paris and a few other cities — one more in line with the advice of the market economists. Velib rents the bikes on an hourly-to-annual subscription basis. Sponsored by an outdoor ad firm that can place advertising on the bikes, Velib incorporates more than the concept of deposit and pay-to-ride to make the service work. 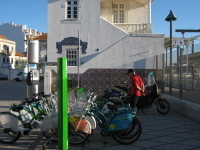 For starters, there are more bikes available from more self-service stations with the swipe of a credit card. (Since most work and shopping trips originate from home, rather than high-density central locations, distribution of bikes is a key requirement to increase use.) A Velib website not only shows the location of stations; you can rollover the station on a Google map to confirm the availability of bikes. Check it out. The density achieved across the city is quite startling. This is a prototypical Across the Great Divide merging of community spirit, sustainable values and market forces. I just hope I don't have to write a retraction in a few years. Yeah, you may be saying, but those European cities are densely populated and their narrow streets couldn't handle western volumes of car traffic anyway. And you'd be right. 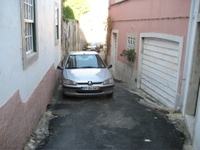 Here's a supposedly through street we walked in the town of Sintra. Nor have I studied the amount of required public subsidy versus the proportion of costs carried by users. But in a system where most of the public are users, that distinction becomes less meaningful. And car owners adapt, rather than trying to dominate all forms of getting around. Streets remain more hospitable to walking. Transit is a more inviting option because the volume of users drives greater capacity and frequency. Unlike on many Minneapolis routes, you don't worry about missing your bus because you expect the next one along soon. Carless in a Strange Land. Leaving Minnesota before the I-35W bridge contract was awarded — and planning to spend one week on a bicycle and another tramping through cities — I arrived in Portugal primed to examine its transportation systems. 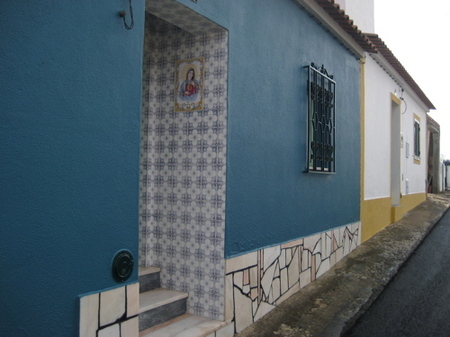 Over two weeks, we traveled by Portuguese light rail, trolley, trains, underground, buses, cabs, bicycle and on foot. We got everywhere quickly and economically from downtown Minneapolis and back without once riding in a private automobile. And, when we did encounter cars on foot or on bike, they invariably gave way to us! As Minnesotans debated the wisdom of investing more in transit, we moved within cities and around an unfamiliar, relatively unprosperous country with ease thanks to its investment. 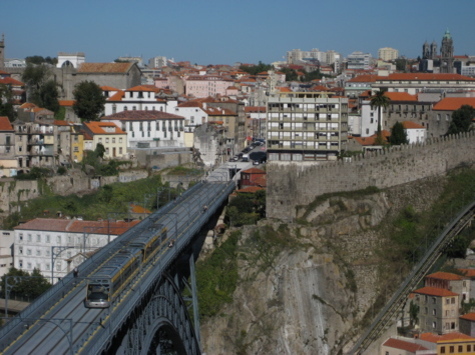 The photo at the top shows a metro train in Oporto crossing the Douro River, a major strategic barrier dating back to the days of the Roman conquests. The line links what in ancient times were distinct cities, Portus Cale and Gaia. Here's another view of the Ponte de Dom Luis I bridge. 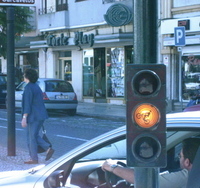 The top is reserved for the metro and pedestrians. A lower deck connecting the riverfront of the main city with the historic port caves on the Vila Nova de Gaia side carries auto traffic. Interesting that, as we in Minneapolis discuss whether to accommodate light rail and a pedestrian walkway on the new I-35W span, this 170-yard bridge opened in 1886 does both. If this bridge looks vaguely familiar, it should. It was a designed by a Belgian disciple of Gustave Eiffel. Together, they had designed an earlier bridge upstream that was renowned because it was a beautiful, transparent structure; it also was the least expensive entrant in the design competition and was built in less than two years. Until Minnesotans immerse themselves in experiences outside car culture, they just won't get it. Spending two weeks foreign tongueless and voluntarily cut off from phones, internet and news media (which include, barely, television), invites new ways of listening, seeing and experiencing. I expected to return from our trip to Portugal with new images and fresh thoughts about cycling, politics, culture, public investment, cities, demographics, transportation, wealth and poverty, religion, hotels, food and drink, books, communication, relationships, misunderstandings and serendipitous connections. 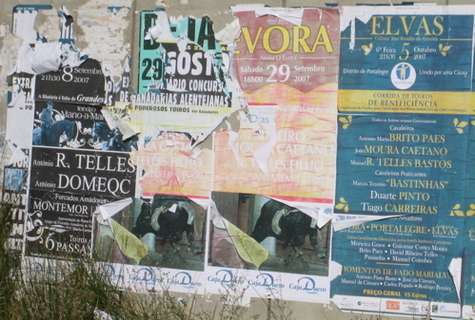 In other words, the stuff that normally fuels this blog and will, with an Iberian flavor, in the coming weeks. But we have to start with movies. The question, suggested by a cafe discussion with my domestic partner, concerned how we mentally edit our daily experience. Not in reflection or in preparation for public display, but in real time. Where do we point the camera? How often does it move? Who is included in the foreground or allowed to comment on the action? Are we inevitably in a star-driven vehicle, featuring Jennifer Anniston in a stretch limo or Jack Nicholson still pretending he's just one of the Easy Rider gang? Or are we hitting the road in an Eric Bogosian-style one-man show or swimming alone to Cambodia and points beyond? Or are we more the auteur and, if so, are we Leni Riefenstahl, John Huston, Robert Altman, Woody Allen, Kevin Costner or Orson Welles? On another day, I might have a different answer, but this morning, the only proper response would be: I am Mr. Bean. Over the two weeks, we negotiated every form of non-driving transportation available, save animal-drawn, leaping from bicycle to bus to trekking and train to metro to cab to airplane, all the while keeping track of our baggage. We almost made it home. This morning, however, at 5:30 a.m., I awoke in my own bed to the dreaded post-vacation question: "Where's my black bag?" As in, the black bag containing all my DP's cycling clothes and her bicycle seat. As in, the black bag I had already once retrieved from a departing train after we'd momentarily misplaced it in a distant compartment while finding our proper seats on the way to Aveiro. As in, the black bag I'd assumed responsibility for as our impedimentia increased during the trip. As in, the black bag I'd no doubt been referring to when I said, as we left the light rail station at First Avenue, "I feel one bag lighter"
In a perfect world — maybe even in a normal one — we'd have realized that was because I was one bag lighter, and I would have turned around and retrieved the missing bag. In a Mr. Bean movie, I would have continued another block, before racing madly after a departing train, leaving a food-poisoned Susan with all the baggage, no money and surrounded by a band of gypsies. In fact, the only difference between reality and the Mr. Bean movie — which we watched together on the return flight, and which touched on all the aforementioned themes, including alternative movie edits — was the lack of gypsies and our jet-lagged capacity for mutual self-delusion. Now we must wait until Monday to discover what happened to all those loose plot ends involving bicycles, self-involved movie directors, lost articles, trains, food revulsion and the rest. Unlike a Mr. Bean movie, my subsequent posts will deliver just the best bits. 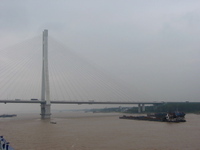 Two Reasons Not to Be Bridge Commissioner in China. A new bridge collapses in China. Although MnDOT Commissioner Carol Molnau was just there, I think everyone will give her and fellow Republicans a pass on that disaster. 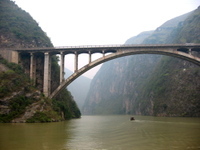 During a late 2005 trip through China, we passed under a lot of bridges and saw a lot of construction. 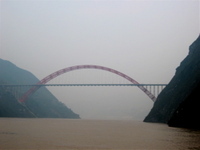 Through much of China, rivers are still the highways and they divide large sections of the country unless you travel by boat. But the rush to develop is on, and it was clear that much of what was being thrown up was not built to our standards. A country where structures had survived many centuries was now fast-tracking. Modern cranes and bamboo scaffolding might surround the same building. We're seeing other consequences from rapid development and lax controls — in imported food, toothpaste and toys. While China may not enforce quality on the front end, it has its own way of dealing with poor outcomes on the back end. One owner of the factory that produced lead-painted toys for Mattel committed suicide, and federal agency officials have received the death penalty for corruption that might earn a "not-so heckuva job" wrist slap here.